Whatever happened to supporting your team no matter what? The glory days are back in Perth and the fans should be too, but increasingly we’re seeing a rise in the number of fans whose only contribution is to boycott. How enjoyable was Perth Glory’s 4-3 win over the Western Sydney Wanderers? Sure, the defending was rubbish and the VAR usage as questionable as always, but the game itself was enthralling and the Glory’s comeback was simply immense. How the Wanderers threw away a 3-1 lead with less than 13 minutes remaining only they will know, but as soft as the decisive penalty decision was, Wanderers skipper Brendan Hamill should never have put his arms around Andy Keogh. Juande still had to step up and dispatch the spot-kick, and you’d be hard-pressed to find a better penalty to win a game than the Spaniard’s unstoppable effort. And didn’t the Glory fans celebrate? Or at least the ones who turned up at the newly-renamed HBF Park. Only in Australia could a state government redevelop a stadium for a rugby franchise that no longer exists and practically price the other tenant out of the venue. Funny, too, how all these naming rights sponsorship deals never seem to have any effect on ticket prices. Glory owner Tony Sage has long bemoaned the cost of playing out of HBF Park, but when it’s passed onto fans – it costs at least $37.50 to buy a general admission ticket online for a Perth game – it’s no wonder only 8945 spectators turned up to watch the home team see off the Wanderers. Meanwhile, there’s trouble brewing in Brisbane, with The Den making a statement on Saturday announcing there’ll be no organised support for Tuesday night’s clash with Melbourne Victory. 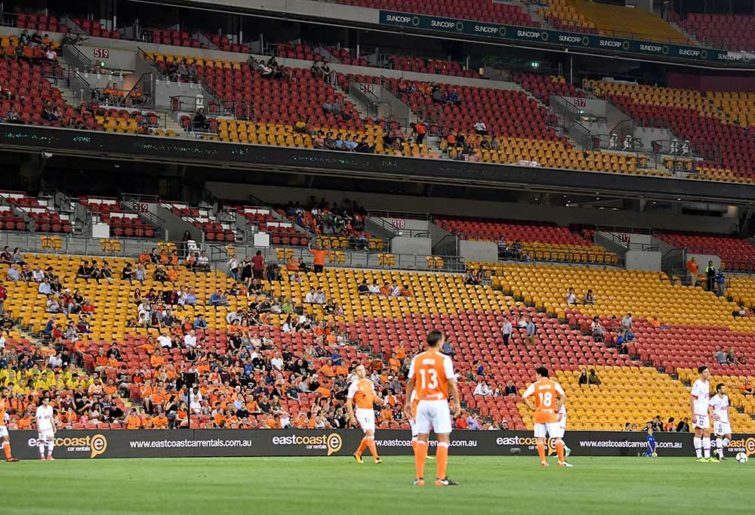 Brisbane Roar’s home end has dwindled to such minuscule proportions that several times this season it appeared to have already ceased to exist. So what, exactly, will be different on Tuesday? No fans singing is still just no fans singing whether you’ve announced an official boycott or not. And at the risk of being bailed up at Suncorp Stadium by angry Roar fans unhappy with what I’m writing about the club, there’s at least one more unpalatable truth that needs to be delivered to the leaders of The Den. Not club officials. Not the media. Not even Football Federation Australia. The guys who have consistently proved incapable of leaving their differences outside the turnstiles in the interests of supporting the club, and who have instead effectively divided the terrace instead of uniting it, are just as much to blame for the lack of atmosphere inside Suncorp Stadium as anyone else. Here’s some friendly advice – sort it out. And stop blaming external forces for problems you’ve created. No such concerns at Sydney FC, I’m happy to report, where things are going swimmingly down in Kogarah. That is, of course, if you ignore the fact that precisely 7521 fewer fans filed through the gates against Adelaide United as did for the Sky Blues’ first Sunday home fixture against Melbourne Victory in November. There’s a whole host of reasons A-League fans pick and choose the games they go to – the dog’s breakfast of a fixture list among them – but it’s still frustrating to see such huge discrepancies from game to game. Still, some clubs like the Wanderers have got it much worse. They don’t even have a home end to speak of, and will need to build one entirely from scratch once they move into their new Western Sydney Stadium home. It would be wrong, of course, to blame all these issues on supporters alone. The hardy souls who watch the A-League often jump through hoops to do so.